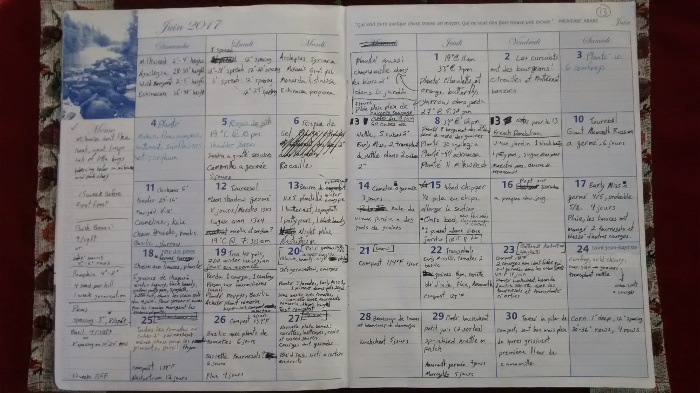 June was a busy month. It is difficult to describe because things started to spread out. If you came over for a visit early in June you would have seen something like this. Entering the garden from the parking trail, on your left is the chive patch where the volunteer chive grows. 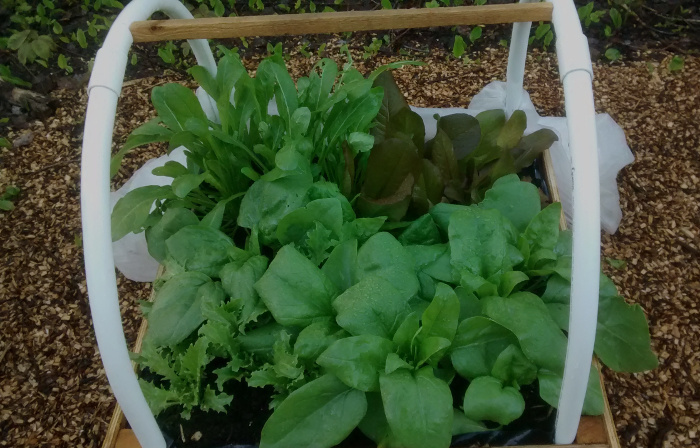 To expand the patch I transplanted several seedlings and sowed most of the remaining seeds I had saved from 2016. Just behind the chives is the wild chicory patch and a big ant colony. Apparently a chicory planted in an ants nest will have red flowers so that’s why the chicory went there. The ants quickly got rid of the transplant so no red flowers. 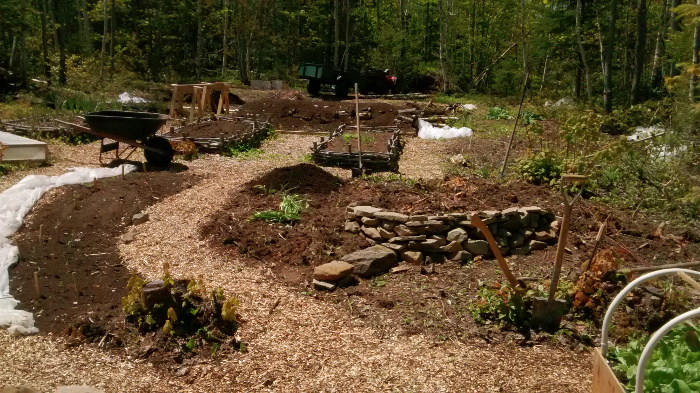 Looking South on the right side of the garden is the cabin trail, the compost pile and the mullein patch. Sorry, no pictures. The mullein is on a rough spot. Moss and hardy spruce saplings grow there. That’s about it. The broadfork is useless there because it’s mostly rock. 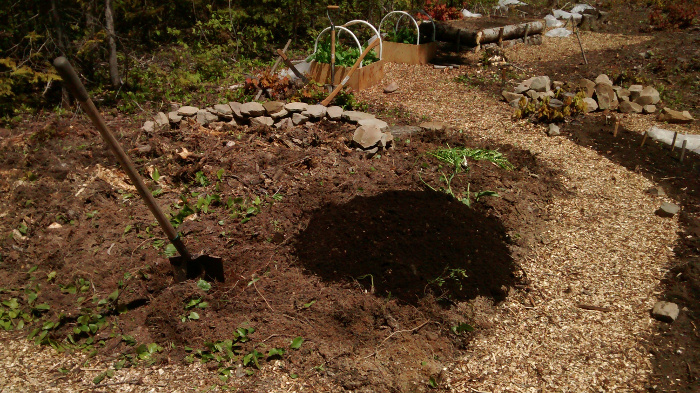 I scraped the surface and covered with 2″ of compost. I then mixed the whole packet of seeds (from Richters) with some dirt and threw it on the patch. Are there broadcasting techniques to spread seed evenly? Because even though I did my best most of the seeds landed in the same spot. 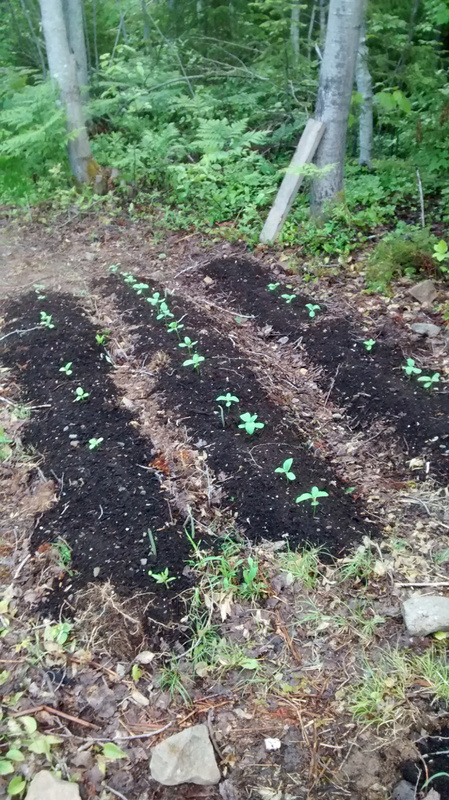 Eight days later there was a carpet of mullein sprouts. They grew very slowly and after some weeks all trace of mullein disappeared. I considered this another failed experiment and forgot about it. Farther along in the garden we now come to the pseudo hugel. 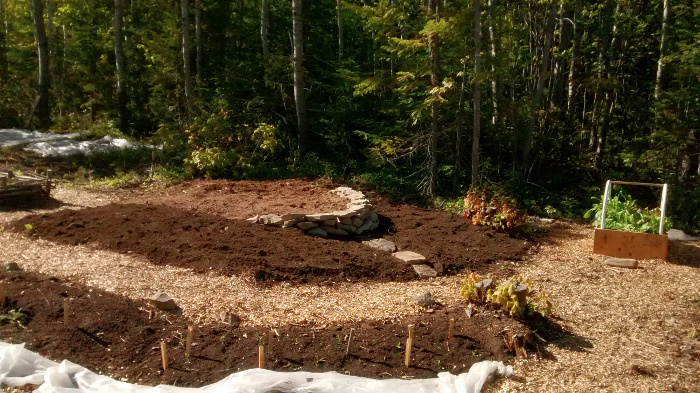 I sowed yarrow, flax, radishes, kale, endive and lots more on that lump. Pretty much everything I planted on top of the bed shriveled up in the summer heat. At the base of the bed everything edible was eaten by slugs. The base did stay damp much longer than the rest. Yarrow transplants did OK. I don’t think any seeds germinated. The tomato transplants weren’t productive but they did set fruit. Mushrooms grow on the hugel, slime molds too. And snakes live in it. 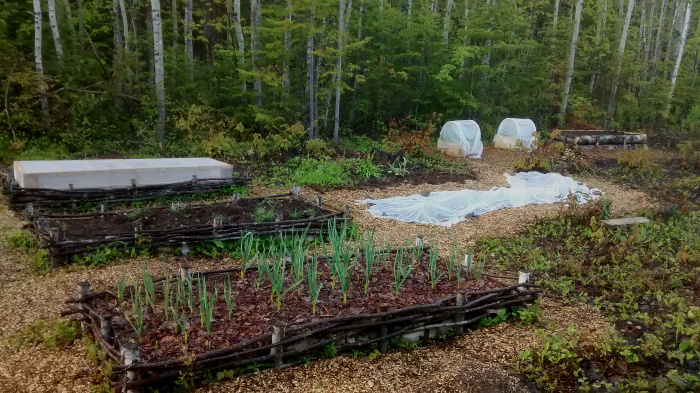 On the left of the hugel is the sunflower rows, just besides the rhubarb. One row of Moon Shadow and two rows of Giant Mammoth Russian. Next to the sunflowers is the black sorghum patch and next to that is the milkweed patch. Black Sorghum. Slugs didn’t bother sorghum! yay! 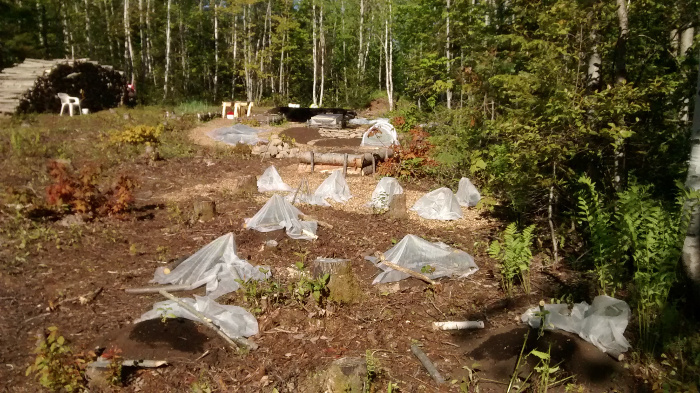 Past the old wattle beds is the Zloty Lan german chamomile patch followed by orange butterfly weed (Asclepias tuberosa). 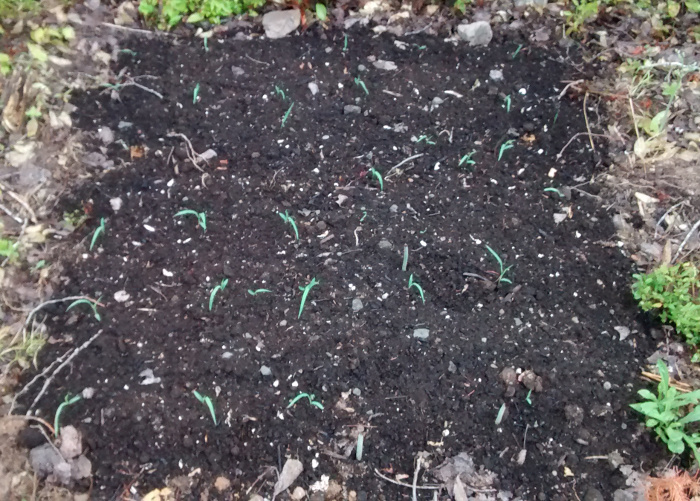 The garlic is doing fine! My second mistake. 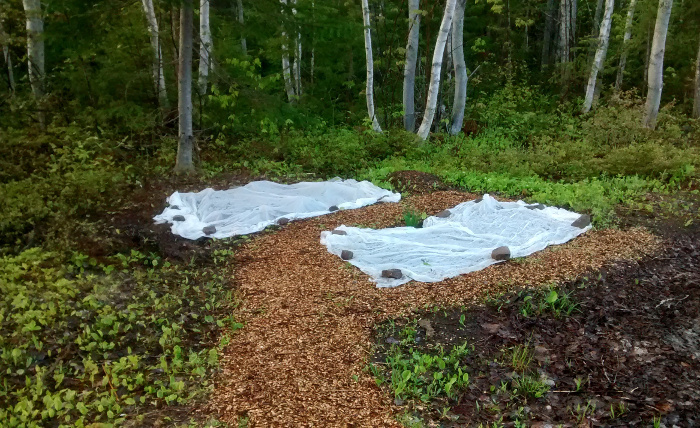 Putting woodchips around plants when the soil is cold and waterlogged is not a good idea. 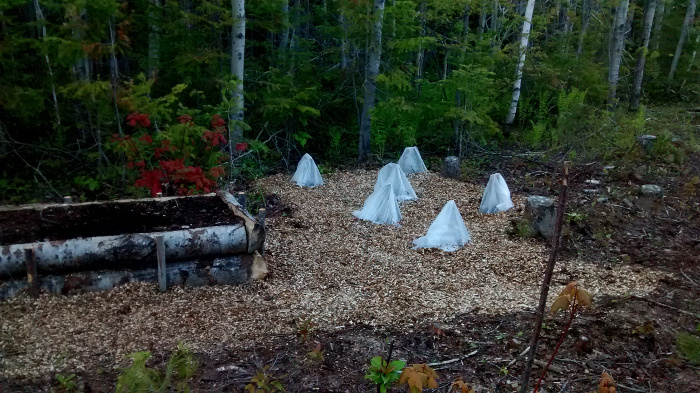 It is amazing how much woodchips will prevent the ground from drying up. Slugs love comfrey. Here is the perennial flowers patch. At first I planned on leveling the area but that would have been a big job. So I took the lazy route and built up over the dead stumps instead of leveling down. I had fun improvising with rocks. Almost done. Columbines in front, echinacea in the middle and wild bergamot in the back. 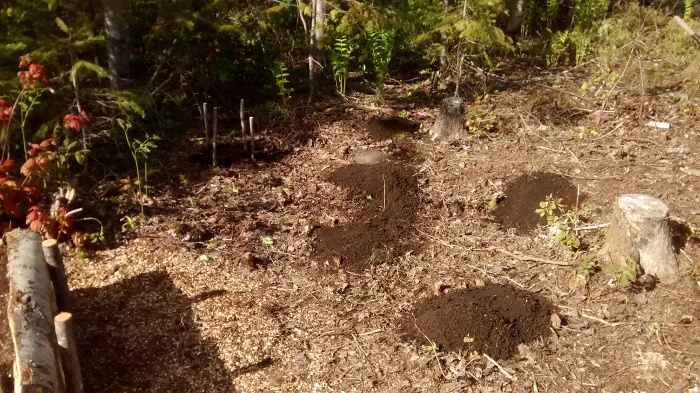 In the far end of the garden I made mounds for squash. Winter Luxury Pie, Black Beauty, Yellow Patty Pan and seeds from store bought fruits (butternut and spaghetti squash). The woodchip pile was getting used up fast. 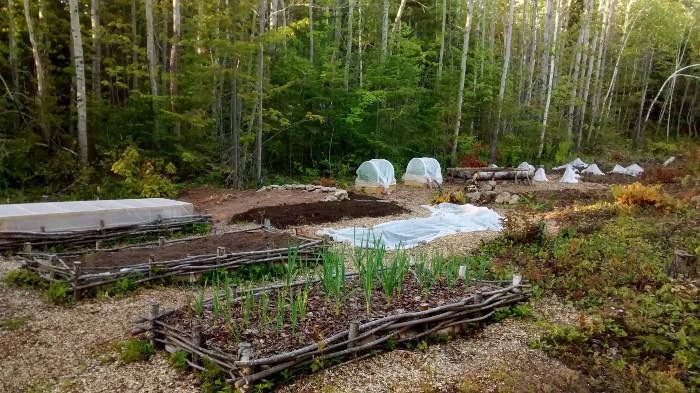 This is what the garden looked like at this point.